Everything you need to Rejuvenate 1600 Sq Ft of tile flooring. Residential Homes, Rental Units, Etc. For a Great Deal of Square Footage a Floor Buffer and blue Scrub Disc will come in handy. 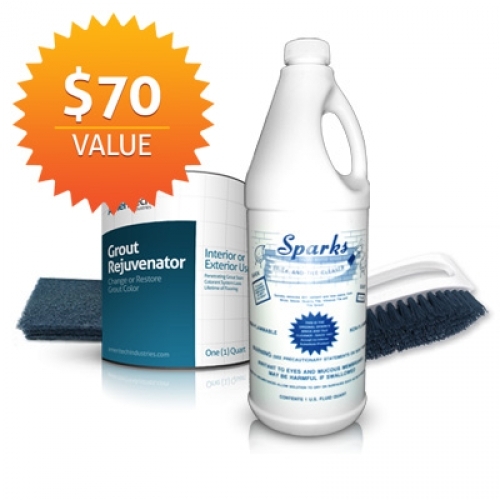 Grout Rejuvenator matches colors to national name brands of grout. For Example: If you were to purchase a bag of grout at a big box store “Home Depot” you would be purchasing Custom Polyblend Grout. We match their color charts. Grout Rejuvenator is not associated with the any national brands of grout, but we match other grout company’s charts for contractors who need a specific shades or colors that their client has requested. If you don’t have the need to match a specific name brand of grout then simply pick the best shade that suites your current needs for your floor tile. It makes no difference what type of grout is on your floor at this time. 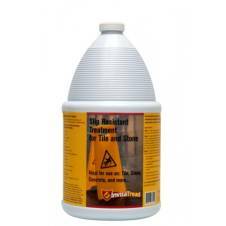 Grout Rejuvenator will work with all types of grout manufacturers. Love It. So easy to use and my floor looks brand new. I do recommend purchasing the blue scrub pads with it. They cost a few dollars more, but they made the job soo much easier than my kitchen scrub pad. Plus I got a color that matched my tile perfectly and I couldn’t find any other companies that had a similiar shade. Great Product. Will recommend to all my friends. I just wanted to send you a message about how your product worked for me. About 4 years ago I had my master bathroom redone. The process included replacing the vinyl floor with white tile and white grout. The grout was not sealed. Well, after 4 years of daily use the grout had turned a medium tan in color and no amount of cleaning with any product on the market helped. So I decided to try to dye or stain the grout white in an effort to make it look more presentable. I ordered your grout coloring product for this job, but before I used it I thought I would try to clean the grout with your Sparks Brick and Tile Cleaner. I want you to know I can’t remember ever writing to any company to praise the performance of their product, so this is a first for me. But after seeing the way your product cleaned that grout, I decided it was worth letting you know how pleased I was. The Sparks Brick and Tile Cleaner cleaned the grout so well, it no longer needs to be redyed. It looks terrific!. I can’t say the application and scrubbing process was easy but the results were well worth the effort. Just thought you might want to know. Best product ever, used it in my kitchen after cleaning it. looks better than the day the installer put it in. color was a perfect match to what we wanted. wish we would have done this years ago. easy to do also.